Hi and thanks for stopping in today! 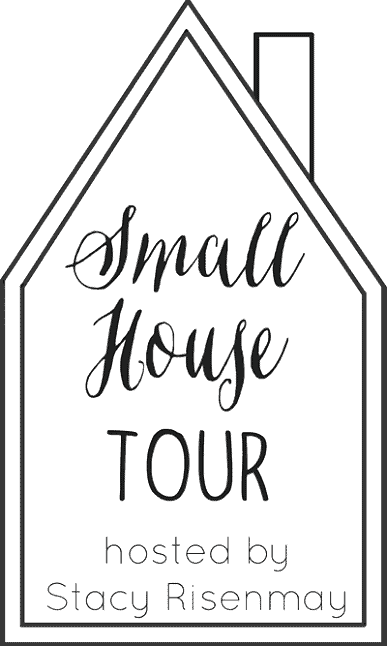 I’m so excited to be joining up with 12 amazing bloggers as part of a small house tour, hosted by Stacy from Not Just a Housewife, to share tips and ideas on making the most of your small space. 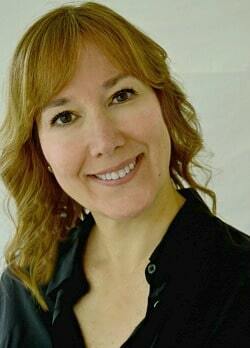 If you’re coming from Doreen’s at Hymns and Verses, welcome! Since this is a small home tour, I’ll fill you in on a few details of our home. My husband and I live in a 1950’s brick ranch with 3 bedrooms and 1 very small bathroom in just under 1200 square feet, we also have an unfinished basement. This house is the smallest we’ve ever owned so making the most of the limited space has been quite the learning experience and, at times, a huge challenge. Let’s start the tour in our galley kitchen, that’s been undergoing a major renovation for the past year. When we moved in, 2 1/2 years ago, there was very little storage space and no pantry. We tried to remedy that during our renovation by building extra cabinets on an empty wall, and adding this awesome barn wood shelf for our everyday dishes. This renovation has been a labor of love for us. Yes, it’s taken us more than a year to do but we’ve tackled it all on our own from the subway tile backsplash to the granite countertops (that we cut and installed ourselves) to the plank ceiling. 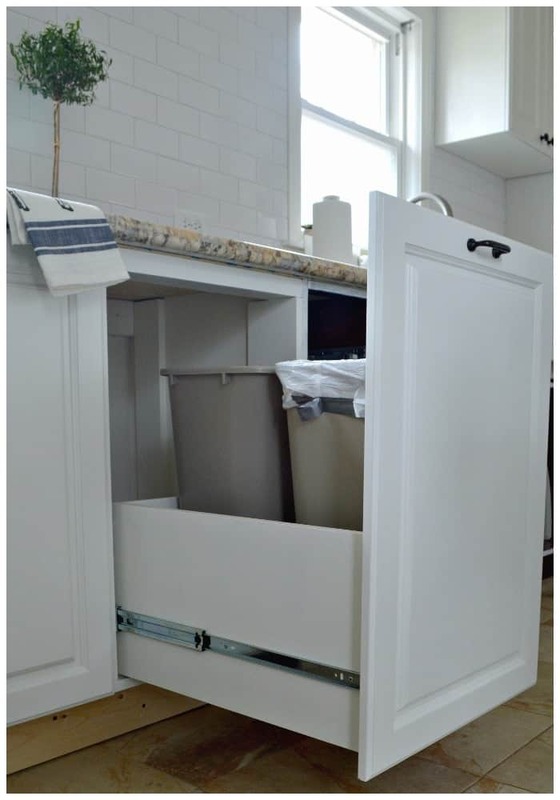 We also added quite a bit of extra storage, like this custom-built drawer that holds our garbage and recycle bins. I love having them hidden away. Next is the smallest of our 3 bedrooms. This room was a huge challenge when it came to furniture placement and storage because it has three doors, three windows and is a walk-through from the kitchen to the bathroom. Phew…a lot of obstacles but I think we made the most of it. Because bed placement was a huge issue we built a platform bed to fit the space, adding cubbies with baskets for storage and locking wheels so I could move it to clean or to make the bed. We also added more barn wood shelves in this room, since there were no surfaces for decor, and an antique armoire for additional storage. One of the most challenging rooms in the house has turned into my favorite. I’ve always used mirrors when decorating any home that I’ve lived in but they serve a greater purpose in a small home, they open up a room. Now that I live in a small home I use them in every room, all shapes and sizes. In my master bedroom though, I went big and tall and it’s really made a huge difference. The only bathroom in the house is teeny tiny, which meant I had to get really creative so we could store all of our necessities. I’ll admit, I purged a lot when we moved in, because there just wasn’t enough room, but I was able to keep everything that I really needed. We used open shelving for towels and I keep all of our soap, cotton balls and cotton swabs out in pretty glass jars so that they’re handy. In the vanity I used drawer organizers and added a sliding basket to keep things neat and easy to see. I also added a small cabinet under the built-in shelves for all of our extra toiletries. Our living room is actually 3 spaces in one, the entryway, the dining and the living area. Dual purpose furniture is a real necessity in this room and we have utilized every inch. 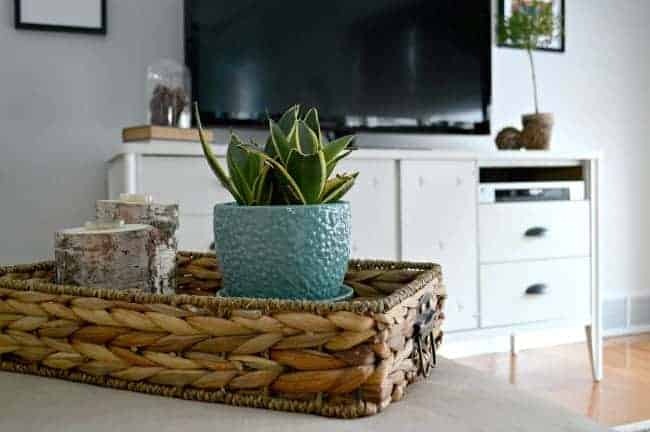 The ottoman holds our throws and a game or two and, since we have limited surface area for decor, I use it to show off my latest favorite finds. The media cabinet, which just got a makeover, was a bedroom dresser in a former life and offers lots of storage space for movies, candles and my photography gear. The previous owner left an electric fireplace here when they moved out and this piece offers so much more. I am much more selective when it comes to my decor since we moved into this house. I only buy what I really love and I make sure that whatever it is that I do buy can be used in different rooms. I’ve walked away from plenty of really lovely things because they didn’t fit my criteria. Not always fun but hey, I’ve probably saved myself a ton of money by sticking to my two simple rules and it’s kept me from getting stuff that would just sit in a box in the basement. Clutter is a killer when you live in a small home, and for me, that’s the number one tip for living in a small house. Thanks for stopping by and taking our small house tour. Looking for more small home inspiration and tips? Check out the other awesome bloggers participating in the tour. 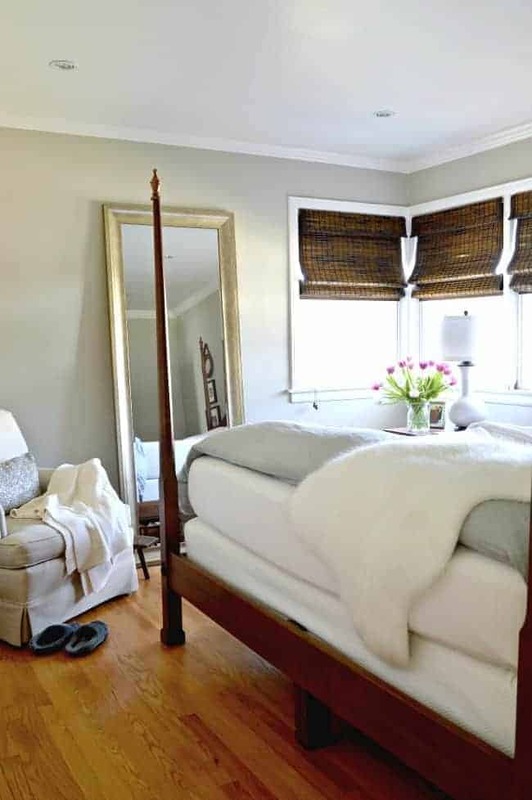 Could you tell me the color of the paint used in the bedroom shown with the standing mirror? Hope that helps. Happy weekend! You made such good use of space you did have. You have great ideas and made your home look so warm and cozy, well thought out. Love what you did in bathroom, so attractive. So enjoyed seeing how you made such good use of areas for storage, love your new kitchen and other rooms. We have 16×80 single wide mfg. home, less than 1100 sq. ft. Not much storage, no linen closet and really small walk-in closet. For bathroom we use a 9 cubby storage stand under window, does trick, very useful for toiletries and towels. Hubs built shelves over toilet which is in little area of it’s own on back side of our closet. The master bathroom is nice size, is at end of home, our room is just before it with nice size room. Use covered wicker long/low basket for sheets, shams, etc. under bed. Know how it feels to live in cramped quarters as we lived in our 24 ft. travel trailer for 10 months here, few months in other places we had moved before here, was handy to have travel trailer to live in while we looked for place to live wherever we moved. Would put household in storage until we found a place, 2 or 3 moves at least. Then didn’t have to set up house twice each move. Trailer had bunk beds in back which were so handy to store our clothes and towels. Hope your move to No. Carolina is what you both are happy with and pray your hubs likes his new job.. Have great week. Thanks so much JaneEllen. It was an adjustment getting used to living in our small home, but we figured it all out and I learned a lot. It sounds like you and your husband have made the most of the small homes you have lived in too. 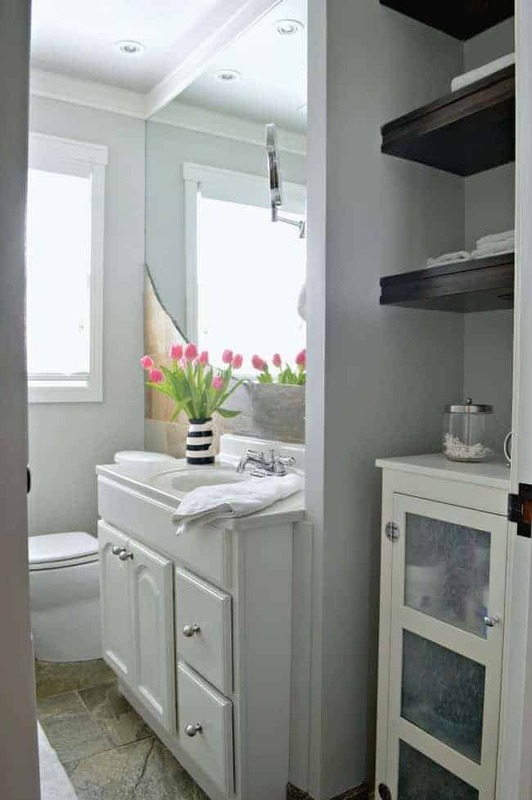 I love the idea to use the 9 cubby storage stand in your one bathroom. We’ve camped too, and there’s no greater test for living in a small space than that. It can be fun but you have to really be organized and only have the bare necessities. Thanks for stopping in and for sharing some of your small space living tips. Happy week! Thank you so much Debbie for the sweet comment. Beautiful home. We just downsized from 3000sq ft to a 4 BR, 1 bath, 1200 sq ft home. My bathroom is HUGE but my bedroom used to be a closet. You are very correct….you have to give up so much stuff, and have strict rules about what enters the home. Storage is an issue but has got my creative juices flowing! Hopefully in a few years my home will be the awesome space I envision just as your home did! Hi Lisa, thanks for stopping in and for the sweet comment. Wow, 3000 sq. feet to 1200 square feet is a big deal. We did the same thing when we moved from Georgia to Florida so I know what you are dealing with. Best of luck in your new home. I just love your platform bed. I’m going to try something similar using bookcases. Lovely blog! Thanks Julie, that’s so nice of you to say. What a great idea to use bookcases. I’m sure it will look awesome! You’ve used some really creative ideas, Kristi, and I’m so impressed that you did a lot of the projects yourselves! 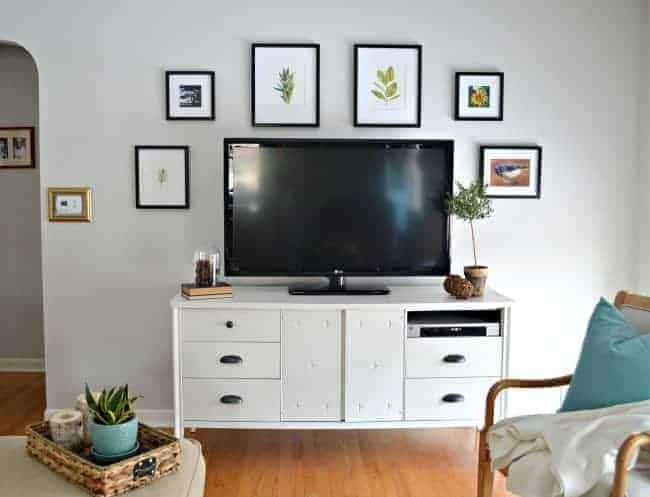 I love your gallery wall and open shelving. And I like the clean and simple look in your master bedroom. Thanks so much Tara, I appreciate you stopping in to take the tour! The kitchen is coming along and I’ll be so happy to share the whole thing. 😉 Happy weekend! Love your home and how warm it feels! The one word that kept coming to my mind as I looked at your beautiful homes was, FRESH! It seems like such a calming space to spend time it 🙂 LOVE it! Thanks so much for the sweet comment Stacy and for putting together the blog hop. 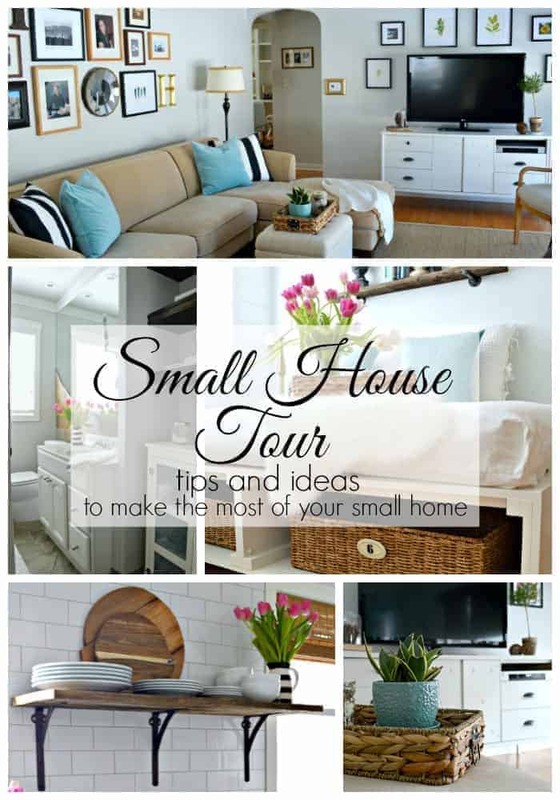 It’s great to see so many awesome small home ideas from everyone. I am happy to be a part of it. I too have a “small” brick ranch built in 1969.. I have 3 bedroom, 2 baths, AND unfinished basement! We have also lived there for 35 years. Love your blog!! Such a sweet comment, thanks so much Anne. Hope you have a great weekend! Love this. I live in a very similar home, except our tiny bathroom doesn’t have that extra space just outside for shelves & cabinet. We have that same arch-way door going into hallway, so was intrigued with your furniture placement. 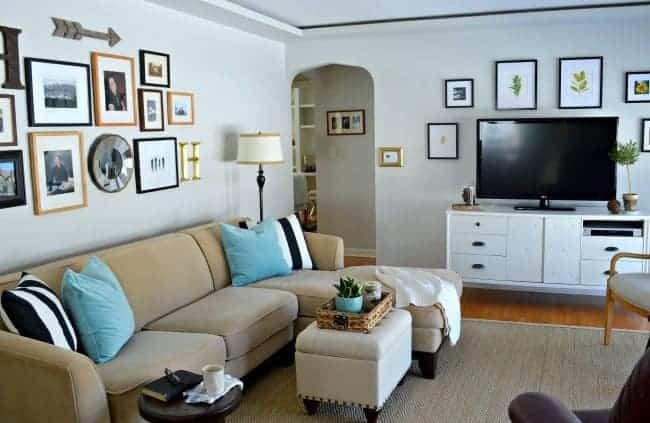 Do you have another archway door on the other side of your couch? We keep pondering the wisdom of closing off one of the doorways to allow wall space in the kitchen on the other side of that wall. We’ve already enclosed our front porch and changed our entryway to the side of the house. My husband changed a side window into a doorway with a small entry deck now. Aren’t small homes fun??? Thanks so much for stopping in to take the tour Jan, and for sharing a bit about your own small home. Have a great weekend. Enjoyed it very much Kristi! 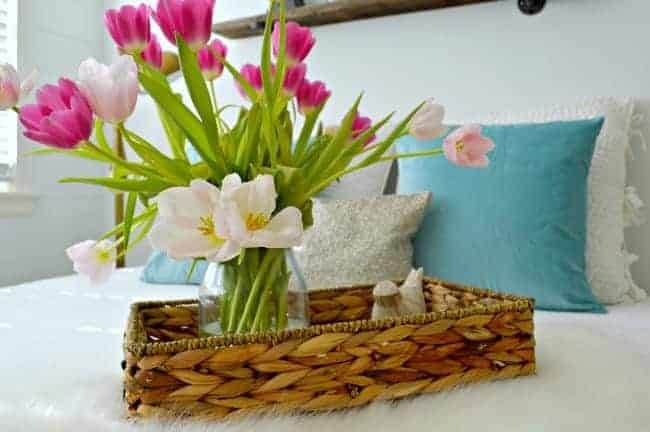 Your home is both lovely and very cozy, every little detail, thought thu and loved by you! I can see it in every photo! Love it! I love love your open shelving ideas! I love what you have done in your small home. I always check your blog first since you’re one of the only ones out there who is dealing with a 1200 square ft home as I am – and I have no basement for storage, although I do have 2 tiny bathrooms instead of one. Your ideas are so appreciated. Thanks so much Pat, your comment made my day. Living small is sometimes a challenge, but we are really enjoying our space. Lovely, Kristi. You have certainly made the most of your living space. Love your home! The living room is so cozy! I love how you decorated it! 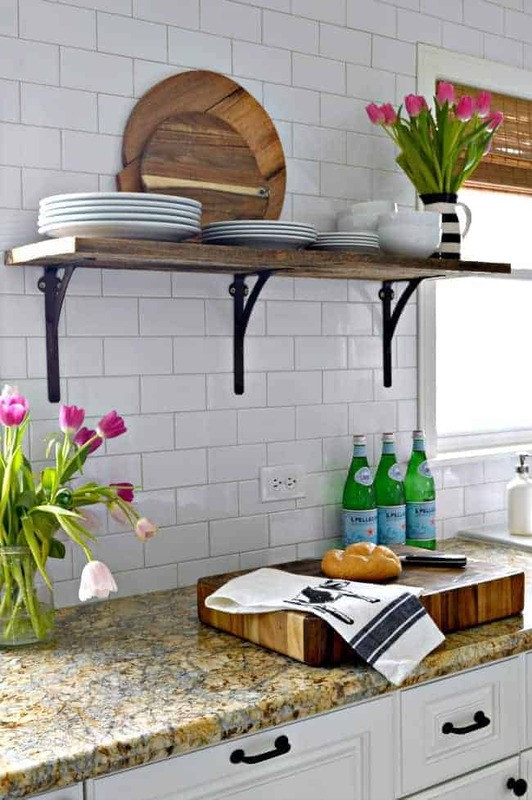 I also love the subway tile in the kitchen and that wood shelf! So pretty! It has been fun touring with you this week!